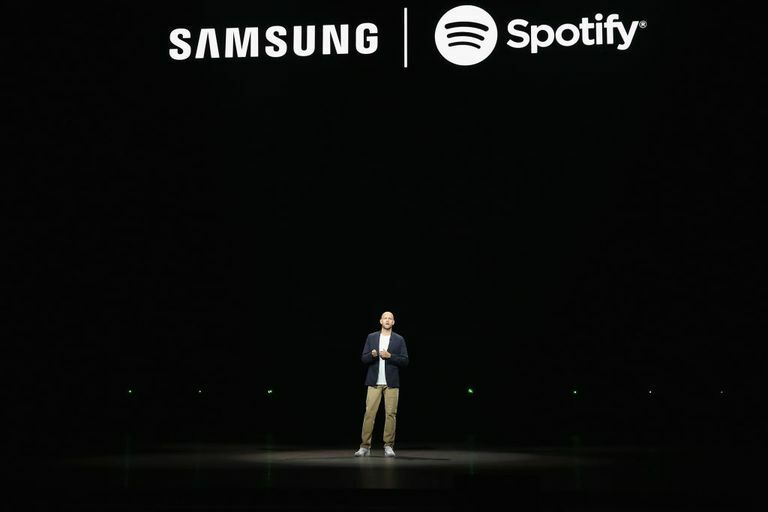 Spotify CEO Daniel Ek announces Samsung music collaboration. Samsung and Spotify have announced a partnership that's expected to make it easier to listen to and control Spotify using Bixby, Samsung's smart assistant. Samsung's latest smartphone, the Galaxy Note 9, is the first mobile device released with Spotify integration. The collaboration expands the functions of the Spotify Connect feature already found on a number of devices, making music transfers even easier for Samsung users. For example, a Galaxy Note 9 user can listen to a song on the Spotify app while they're out. Once they get home, they'll receive a prompt on their smartphone to connect to a different Samsung device to continue music playback. Later, they can manually turn on or voice activate another Samsung device in a different room to continue listening to music, uninterrupted. The integration is thought to be based on users' regular device usage patterns, meaning if a user prefers to connect their Spotify playlist to their Samsung Smart TV upon arriving home, they'll receive a suggestion to connect to that device, as opposed to a different Samsung device. Alongside the announced partnership, Samsung previewed its own smart assistant speaker, the Galaxy Home, which will have special Bixby and Spotify features. The speaker hasn't been officially announced and likely won't be available for several months, but it will allow Bixby to play Spotify music at a user's request. Spotify will be Bixby's primary music source, and users will be able to use Spotify with the help of Bixby even if they've never used the service before. Bixby and Spotify integration is expected for the Galaxy Note 9 and other Bixby enabled smartphones. Spotify will also be integrated into the Samsung Music player, allowing users to play Spotify music and receive music suggestions through the Samsung app. Of course, Samsung and Spotify want to get more users signed up for the service, so Spotify will be among the suggested apps for download through the Samsung Smart Switch feature. The feature helps users transfer apps and data from an old device to a new device, and the Galaxy Note 9 will suggest using Smart Switch during the device's initial set up. Users can also transfer apps with Smart Switch after the initial Galaxy Note 9 set up. Samsung and Spotify's partnership remains in its early stages, but the companies are planning deep Spotify integration with many Samsung devices. Soon, users can link their Spotify and Samsung accounts to Samsung TVs through the Samsung SmartThings app, which will help enable the abovementioned seamless music transfer. The companies also showcased a concept image of a Samsung smart fridge displaying Spotify controls on its screen.